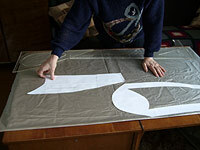 About the method used in the program "Cutter"
Those who able to sew also know as frequently appears difficulty of using of an exist patterns on a figure of a concrete customer, when without many additional fitting and adjusting to custom figure a pattern will not succeeded correctness. This solution, released in the program "Cutter", by comparison, is little known. The reason for this problem in the fact that the patterns of the model selected by customer are built to another size or figure, and trimming distorts the required proportions. And the method of interdimensional increases does not give the solution, since also are not considered the specific features. A solution is one - a master should have an individual formal patterns for each customer, and to construct a necessary model on their basis. But also the complex problem. It is commonly used for the permanent clients only. If is possible to find a correct method of calculation of basic patterns and to put it in a program, that is possible to instantly receive a individual formal patterns for each client and to use ones for modelling! The such method is possible, because overwhelming majority of figures, even if ones is far to a factory standard, from the anatomic point of view is normal, and on sewing speaking its are conditional typically. I.e. internally proportional. Artists and cutters a long time study this relations. In same a textbooks and a manuals enough techniques which can are used, but alas (!) ones do not solve this problem, simply because do not give exact recommendations, but abounds the simplified and an approximated recipes. Faced with similar problems in the beginning of her professional career Pavlova Nina Iosifovna during many years testing, combining and developing ways of construction of formal patterns has created the methods contained experience of 40-years practice (the seamstress -> the master -> the technologist -> the teacher of designing), that makes its very exact, also allows to receive a qualitative basis patterns at once. It is obvious, that the best decision is use of the methods in a program, which after entered individual measures and allowances on freedom of moving instantly will calculated and will constructed a basis patterns for each client, and then construction on it model, desirable by a customer, that will occupy not a lot of time and will give a perfect quality. Such program exists: "Cutter". Version 2.76 is completed at the given time. "Cutter 2.76" enables you to make the basic patterns of shoulders garments (those you wear on your upper half) namely lady's dress, jacket, autumn and winter coat of straight and adjoining silhouette. Also the basic patterns of waistline garments (those you wear on your lower half), namely skirts, divided skirt, men's and lady's pants and jeans, men's loose-fitting pants and men's pants with lowered belt according to custom measurements with the following printout of the patterns in scales 1:1, 1:2, 1:4 on paper of any size. Download the demo-version of Cutter 2.76 here! ZIP archive, 1 MB. Will help you to test the program the table of a typical figures measurements. The provisional estimation of the program recoupment can be made so: we shall assume an average cost of an order $25. Cutting is usually estimated in 30 % from cost of an order. We shall reset on necessity of modelling, also we shall add because the program gives speed and quality. We have 28/7.5=5,3 the recoupment after 5 - 10 orders. Examples, in scale 1:4, of a basic patterns for various customers which was calculated in the program "Cutter".